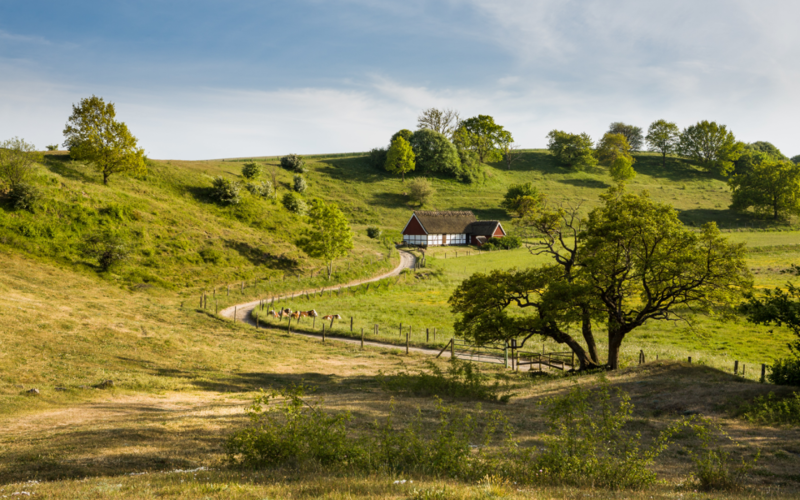 Along white sandy beaches, and then inland over the pastures and rolling hills of Österlen as you follow the meandering of the Verkeån River. 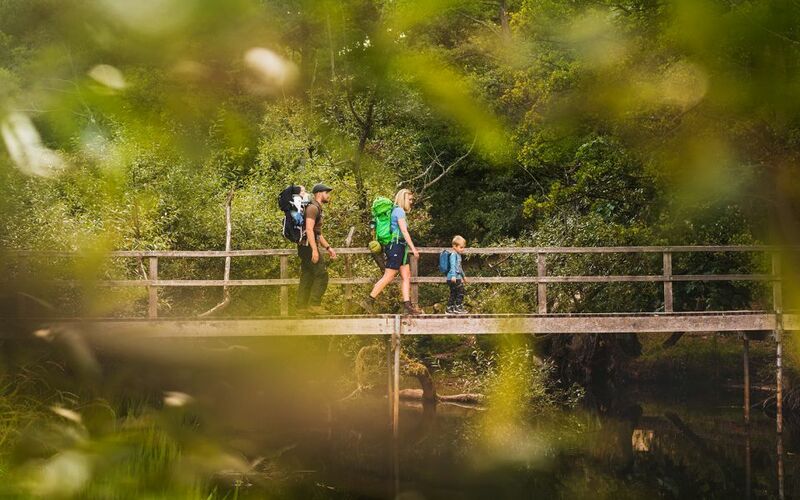 Swim, visit a Stone Age megalithic burial and an outdoor museum, and wander the rare environment presented by the hilly heathlands of Brösarps Backar. Leaving Kivik behind, you follow the shore through the Vitemölla Recreation Area, where you can walk wherever you like. Grazing animals, rabbits and even your own footsteps all contribute to the conservation management. This is a rare, sand steppe habitat where several threatened species have found sanctuary. Don’t miss the view from the hills after you cross the bridge over the Verkeån River. 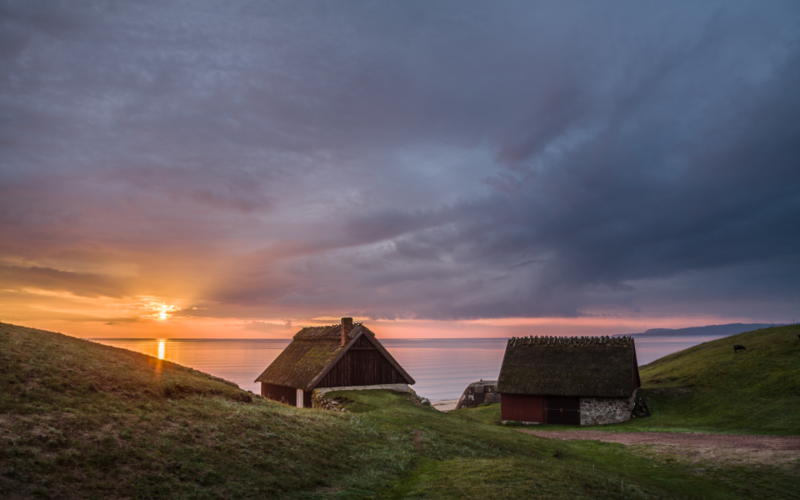 On a clear day, you can spot the island of Hanö to the north, and the Danish island of Bornholm to the southeast. At Haväng, watch for the black and white sand, formed from moraine and quartz respectively. The trail turns inland and you wander across the dry heaths of Ravlunda, and once you pass Route 19, you enter the northern hills of Brösarps Backar, its steep slopes formed by glacial retreat. At times, this sandy, hilly heathland can be quite a demanding hike. The hills are criss-crossed with trails created by the cattle who graze here. In the summer, the air is sweet with such flowers as sand pink, a rare perennial protected under the EU Habitat Directive, meadow saxifrage and wild thyme. Brösarps Backar are a part of the Verkeån River Valley Nature Reserve, and at times you will come quite near the waters of the Verkeån River, occasionally crossing small creeks that flow into it. Explore the small alleys of the little fishing village of Vitemölla, breathing the salty air and the smell of seaweed. Don’t miss the beautiful, old seaside hotel Vitemölla Badhotell. 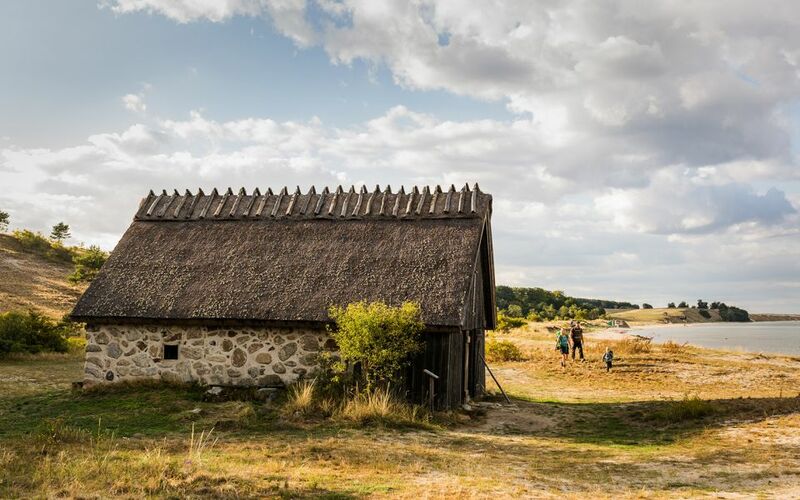 In the Vitemölla Recreation Area near Haväng, make a little detour to Lindgrens Länga, an old half-timbered cottage with a thatched roof – typical for Skåne – that has been converted to an outdoor museum filled with interesting local history and information about the area’s development as far back as the Stone Age. You can also visit Havängsdösen Dolmen, a 5000-year-old megalithic tomb with a large flat stone laid on upright ones, and perfectly oriented for the spring and autumn equinoxes. Who were the ancient people farming these lands during the Neolithic Period, between 4000 - 1500 BCE? At Haväng, the Verkeån River reaches the sea. Poke around a little bit on the shore to see if you can find any reddish-brown “creek coins”. These light chips, approximately the size of a Swedish 5-krona coin, are a bi-product of the alum works upstream at Andrarum. Jagged-edged when they left the mine by the thousands, and tens of thousands, they were carried far downstream, a watery journey that ground their edges smooth and gave them their characteristic coin-like appearance. As you turn inland heading west, you have Ravlundafältet to the south, a military exercise area, purchased in 1943 and still used today. The relationship between the woodland and open areas has not changed since the beginning of the 1800s, when there was extensive farming of rye, potatoes and cereal grains. As you near Brösarp, the trail will cross a vintage railway track – maybe you will see one of the old steam engines puff by. The hill just north of Brösarp was once the village’s execution site. Imagine how this place, so peaceful and beautiful today, once gave passers-by a very grim warning, the gallows a stark silhouette against the sky. There is plenty of room for tents at the Vantalängan campsite, as well as a rest hostel – originally a barn built in the 1800s. Camp here, cooking a meal at one of the grill pits, or head into Brösarp for more luxurious accommodation and eating arrangements.